The CELENA® S is a comprehensive solution for capturing publication-quality fluorescence, brightfield and phase contrast images. Sophisticated software accommodates a wide range of imaging applications such as image capture and analysis, live cell imaging, and even automated cell counting. Capture amazing detail with a few clicks of your mouse. The CELENA® S is a small and powerful digital imaging system that simplifies imaging and data analysis. 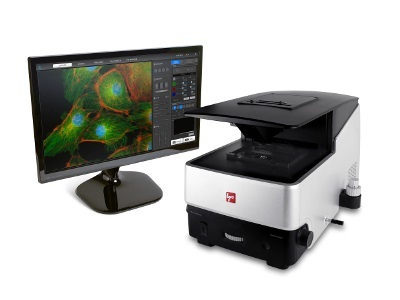 Integrating advanced precision optics, a highly sensitive scientific grade CMOS camera, and a computer with user-friendly software, the CELENA® S allows researchers to capture vivid, publication quality images with ease. Interchangeable objectives and filter cubes accommodate a wide range of imaging needs. Researchers can use the CELENA® S for multiple applications, such as capturing and analyzing multicolor fluorescence images, live cell imaging, and automated cell counting. with the time lapse function or the growth monitor on the CELENA® S.
Combining a microscope, camera, light source, and a computer with software in one sleek package, the CELENA® S takes you from imaging to data analysis in one sitting. Long-lasting LEDs and hard-coated optical filters ensure robust fluorescence imaging. Adjustable LEDs allow precise control over the gain and intensity of transmitted light. Analyze your images immediately upon capture. Save measurement data to a USB drive. Monitor live cells with the time lapse function or the growth monitor. Attach the onstage incubator to control the temperature, humidity, and CO?/O? levels. Capture multiple images along the Z-axis with the Z-stack function. Fluorescence channels	 3 fluorescence channels and 1 transmitted light channel.